Best Holsters for Fat Guys: Concealed, IWB, Belly Band and More! Every human body is different, so it is hard to say what will work with a given body shape and wardrobe choices. Other lifestyle considerations also influence your holster selection. For instance: do your daily activities require a lot of sitting, are you more confident carrying a larger caliber gun, or maybe a printing is a massive no-no at work? In this article, we'll be taking a look at the best holsters designed for those who are a little bigger and carry a belly. If that's you, or your shopping for someone that fits that criteria, stay tuned. A vast array of holsters exist and are designed for the most imaginable carry positions. However some carriage styles may not work with all body types. Most current concealable holsters are one-size-fits-all, but not all holsters work well for all body types, especially if they are a bigger guy (or girl). Of course, a more corpulent guy carrying a gun brings specific challenges that require a slightly different approach and modified carrying standards. Accessibility is the most important aspect of carrying a handgun for personal protection. Without quick access to your defensive firearm you are at a significant disadvantage. As a bigger guy, take into consideration that your carry position will greatly depend on lateral movement with the dominant arm, i.e. how long your dominant is and the range of motion. Drawing a pistol from a cross-draw or shoulder holster may be difficult for a people with a larger chest. For large sized people wearing deep pocket pants, pocket holsters sit inside the front pocket while keeping a small, lightweight handgun easily accessible which makes it a perfect solution for self-defense situations. However, the bulkier pocket holsters may not conceal your pistol well, so take into consideration your clothing style and size of pockets. Wearing appropriate garments in this unusual concealed carry approach distorts the weapon outline for better concealment delivering everything you could want in a holster. A compromise between strong side and underarm holsters, some huskier guys choose to alternate to belly band holsters, little contraptions designed for concealment and secrecy. However, these comfortable holsters are not recommended for obese individuals during high heat days since they will get very sweaty. On the other hand, an outside the waistband holster (OWB) enables you to comfortably carry even your full-size sidearm anywhere from the 3-6 o'clock position. For concealment purposes, OWB holsters should be combined with great covering garments that provide sufficient draping, color, and pattern complexity to conceals your gun shape. Whereas an OWB holster is a natural solution for people with a bit extra around the waist, an inside the waistband (IWB) holster can be a comfortable and easy to carry option. Like OWB holster, using a holster inside your waistband will really depend on the rig’s position on your body. A thinner person probably needs to carry at around the 4 or 5 o'clock position, while larger would appreciate the 3:30 - 4:00 o'clock positions. It ensures better concealment while still enabling a quick draw when needed. Another excellent place for a big guy is a 5 o'clock position which gives good access to your gun, but it may not be the best position if you drive for the whole day. The principles to consider when choosing a holster appropriate for the people with larger midsections are the same as for average sized people. However, it may be most challenging appear when sitting because bigger guys might find the grip and rear of the slid dig into their side, so keep this in mind and opt for comfortable and easy to use holsters. Now that we know what to look for in a Holster for big guys, lets have a closer look at the few good holsters available in the market and look at their pros and cons in detail. The first Blackhawk MT SERPA CQC holsters were purpose-built for uniformed patrol officers, but the design was quickly adapted for agents and civilians who carry concealed sidearms. This OWB Blackhawk sleek package includes both a paddle mount and a belt mount system, with both bases curved to allow a comfortable fit to your body. While both mounting bases use the same three screws, the paddle base has an adjustable cant. This Blackhawk Serpa CQC concealment holster boasts patented the Serpa Auto Lock release, facilitating a smooth drawing motion, easy re-holstering, and unparalleled weapon security. Actually, this unique holster design features a Level 2 security system to secure the weapon into the holster. The first is the adjustable retention and the additional safety measure is active until you properly press the “L” shaped unlock button while drawing the gun out of the holster. Although it is designed for a natural drawing motion, with the trigger finger behind the holster body, the release button is very close to the trigger guard, and some say it can be an unsafe design. Due to its rock solid locking mechanism and dual mounting approaches, the Blackhawk Serpa quickly became popular, widening its offer to more than 40 different handguns. In addition, this retention CCW holster offers the utmost in firearm security and you can feel confident knowing your firearm will never accidentally leave the holster. With well-measured proportions of pocket holster, pocket size, and body size, most people will have no idea what is in your pocket. Leapers UTG 3.9" Ambidextrous Pocket Holster is a reliable way for larger people to keep a handgun in their front pocket while it reducing printing. As the name suggests, it enables both right or left-handed shooters to get a quick and reliable pocket draw from this UTG holster. This small, lightweight holster is made from a durable polyester material, which is double-layered to hold an extra mag. However, this thickness unnecessarily adds a square bulge print in dress or tighter pants. Whereas this small Leapers pocket holster comes without any clips, tabs, or harness rigs, it only features integrated non-slip bands on both sides of the holster. This may cause the holster to remain in the pocket when the gun is drawn. This pocket holster is sized to accommodate anything from subcompact .380, 9mm, and .40 caliber semi-automatic pistols to .38-caliber snub nose revolvers. The UTG Professional Ambidextrous open-top pocket holster is designed with integral front and back storage pockets for holding documents, reload rounds, or other small items. While backed by the Leapers one-year limited warranty, this nylon construction holster works very effectively for concealed use in larger pockets, allowing you to store gear, keys, and other items in the same pocket. 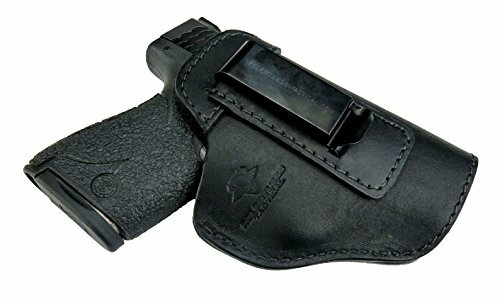 The Don't Tread On Me company has a wide assortment of holsters and pouches for concealed carry, but the premium full grain leather unit connects a high-quality construction, minimalist design, and a great price. The design is particularly suitable for the persons of large body size as it can be worn between your belt and waistband or over the belt (open carry). It works equally well for right or left-handed users, as well as in positions like strong or weak side, and behind the back. While this genuine leather holster has a strong, removable metal belt clip for attaching to either the IWB or OWB, it provides a closer, more secure fit, especially when using belt slots for OWB carry. The DTOM ambidextrous holster completely encompasses the trigger area providing ideal trigger protection. Whereas its open design will enable full-size guns to sit deeper in the holster, the barrel will be exposed and you will feel the metal of the barrel against your leg. Another downside found in IWB position would be re-holstering, as the leather self-closes when the gun is removed. Indeed, this is not a thin little piece of leather but is a professional grade holster made of hard leather, which enables sufficient retention and slight cant with minimal bulk. Smaller design isn’t Viable for Anything Requiring Physical Activity. The holster is advertised as having a universal design that will fit many semi-auto pistols. DTOM Premium leather holster fits nearly any weapon, due to the full-grain leather that naturally expands and conforms securely around almost any size handgun. Gould & Goodrich is well-known for high definition and superb craftsmanship in their gun accessories. The Gold Line back holster is no exception. As you probably know, small-of-back (SOB) holsters are some of the most comfortable carrying solutions around. In fairness, drawing and holstering maybe harder for huskier people with a heavy build, but SOB holsters are not known for the flashing draw speed but for the comfort and ability to hide a larger weapon even on larger bodies. A G&G small-of-back holster is designed to be worn outside the belt via fixed belt loops instead of clips, therefore to remove the holster you have to remove your 1 ½" wide belt. 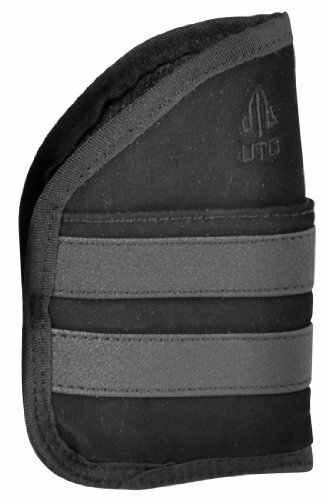 The leather holster features a top reinforced band that helps holster stay open for easy one-handed re-holstering. A Gould & Goodrich Back Concealment Holster comes with an ideal draw angle (cant) and an adjustable tension screw to hold the pistol securely. While the tension screw enables you to determine firmness or ease of draw, it will retain your semi automatic only in casual situations, such as walking around. This small, sturdy, and lightweight leather holster can be broken in to fit your specific weapon perfectly and to fit exact body shape. This makes the holster and gun comfortable to wear against your back all day. A G&G Gold Line holster is a reasonably compact unit available in a variety of sizes for different gun types, such as 1911 style pistols with 4" to 5" barrel and a whole line of SIGs and Glocks. However, more experienced gun owners recommend this as a perfect holster for a backup weapon or an off-duty firearm. We like the fact when a holster presents many adjustable settings so it can be customized to even very large, corpulent people. An excellent example is the Concealment Express IWB Kydex holster, designed to be worn inside the waistband with a belt while featuring an adjustable friction level (retention pressure) and an adjustable cant (ranging from 0 to 15 degrees). There are some complaints that some users cannot fully rotate the belt clip to a 0 degree carry angle, but that is a rare issue. 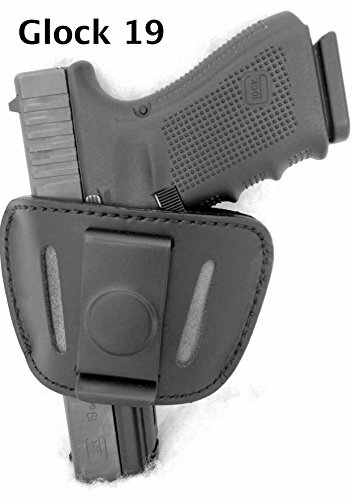 This single-attachment IWB holster with an adjustable cant will secure it to the belt to your preferred position. Its belt clip fits securely on belts up to 1.5” in thickness. The incorporated full-sweat shield protects your weapon from moisture and also helps guide the pistol when re-holstering. This IWB holster comes with the “Posi-Click” retention lock system that makes an audible click to ensure maximum security of your sidearm. 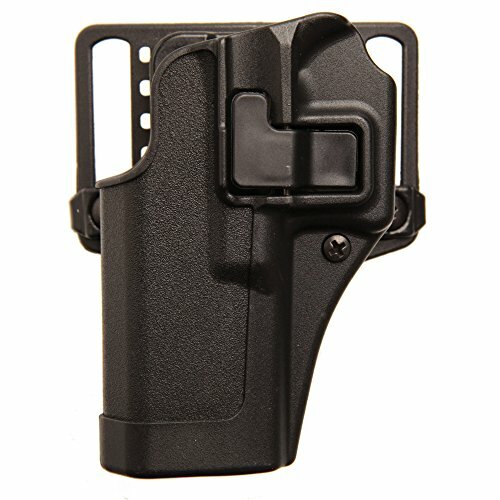 The holster is custom molded from .08" Kydex, so it specifically fits your gun and provides enough thickness for rigidity. In addition, its low profile offers comfortable wearing for both standing and walking activities. Although the trigger area and slide stop lever on Concealment Express holster are fully covered with rigid plastic, it gives you easy access with proper grip acquisition at all times. The hard plastic, Kydex construction protects weapons from the effects of the external environment while remaining extremely lightweight and durable with an unconditional manufacturer lifetime warranty. Whereas the only drawback to any hard plastic carrying rig is the comfort and fit, you can still get all-day comfort when wearing this 2.5 oz. heavy Concealment Express Kydex IWB holster. Holster Made of .08” Kydex and Weighs only 2.5 oz. 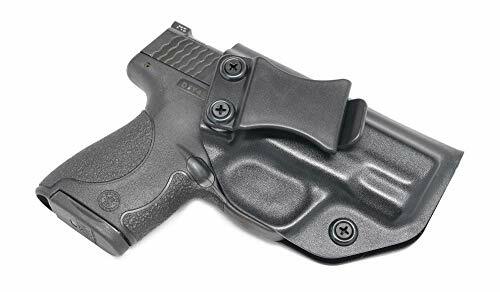 Concealment Express Inside the Waistband (IWB) is a simple, minimalist Kydex holster that conceals well and allows plenty of adjustments for better fitting, making it comfortable solution for larger people. It may be not the ideal product if you wear tight clothes or a suit most of the time, but with casual style or with an untucked shirt you can position this Kydex IWB holster anywhere you like. Relentless Tactical produces some of the finest holsters and leather accessories on the market, while offering a lifetime guarantee on all their leather products to further attest to the quality. While Relentless Tactical cataloged several IWB and belt slot leather holsters, their particularly popular all-around leather IWB holster is called the Defender. With over 100 compatible pistols for the Defender holster, it speaks to its popularity. The Defender Leather Holster is somewhat molded and form-fitted to specific handguns, but will need a break-in period. The Defender fits most Glock, Sig, Colt, and XD style handguns. To be fair, this leather holster is the best suited for small automatics and everyday carry. A minimalist, smooth leather holster based on the IWB design, the Relentless Tactical Defender holds the weapon in place through tension and friction from the waistband. 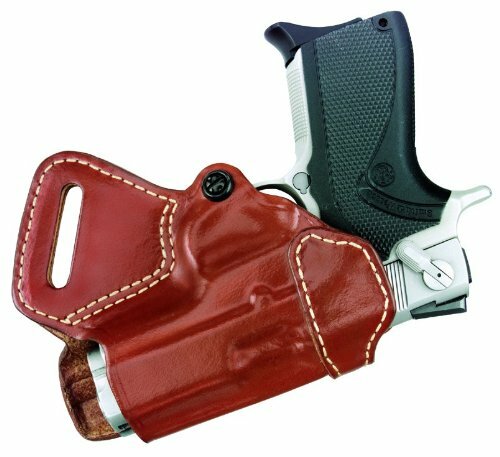 The holster is made from genuine U.S.A. bull hide leather, and when paired with a tight belt, this open top design can yield a very good draw and extremely good retention. The Defender Leather IWB Holster is designed for optimum concealment and uses a single, wide metal clip to secure the holster to both your pants and belt. The Defender is an excellent choice for a concealed IWB holster, allowing you to carry your sidearm in three different positions, strong side carry, cross draw, and appendix. This mid-priced leather holster comes with very strong stitched construction and a reinforced top, meaning it maintains its shape when the sidearm is drawn, aiding in re-holstering. 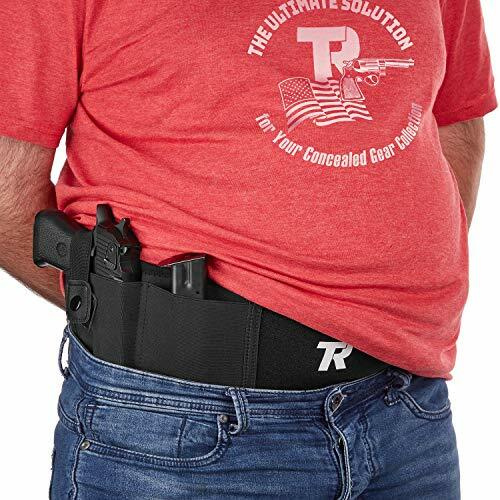 This ultimate inside the waistband concealed carry rig is made from a thicker material that does not make this form-fitted holster bulky or cumbersome at all. The holster is available in brown or black leather for effective concealment and maximum comfort so you can easily conceal with different outfits. LIRISY XL Belly band holster has the best recommendations. There are many reasons, for instance, this product design can be used with both sexes, be adjusted to different types and sizes of bodies without any problem, and can hold a wide range of gun types and sizes. Although it has an adjustable size to comfortably fit larger waistlines, heavier people with large body frames may find it small and very uncomfortable on warm days. As a bonus, the thick, ventilated neoprene handles the weight of the gun well, while it boasts micro-holes to allow your skin to breathe making this belly band extremely comfortable to wear for long periods. Further, the neoprene material is soft and feels good against the skin as it does not pinch skin or pull body hairs. Made of high quality elastic, the Lirisy belly band holster measures 5” wide and 42” long and will comfortably fit up to a 45” belly circumference. Unlike others, Lirisy belly band holster features a quality Velcro hook across the entire belly band to fit even very thin waistlines. The Lirisy holster will support all handguns with overall length ranging from 4" - 8", including almost any subcompact or compact pistol or revolver. Besides the holster itself, the Lirisy XL has an extra pocket for a spare magazine and one more completely removable pouch which can be positioned anywhere on the band. The main pocket comes with a retention strap equipped with snap buttons instead of Velcro. This feature adds support in holding your sidearm but also allows you to quickly and quietly release your gun. 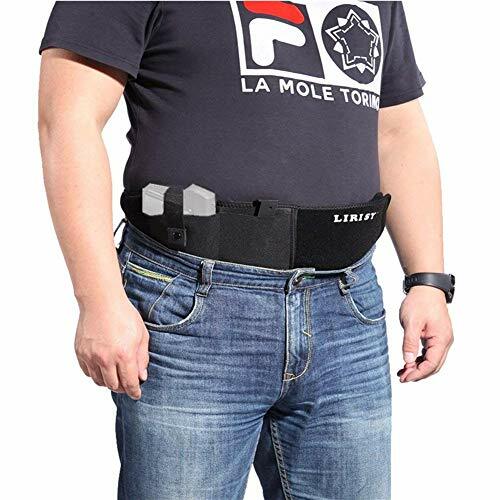 Although the belly bands were initially conceived as IWB holsters, the fully ambidextrous Lirisy XL can be worn in an outfit with no belt and in many different carry positions. This includes outside the waistband, cross body, appendix position, small of the back, and even high up like a shoulder holster. Also, Lirisy Tactical offers a lifetime warranty on their belly band holsters. As you probably know, carrying a gun in the shoulder or underarm holster is the most comfortable way for almost any gun carrier, whether an officer with a perfect body shape or corpulent 250 pound civilian. A step further from the Don Johnson, this classic leather holster is a Yeeper shoulder holster purposely made for deep concealment. Made of lightweight, ventilated elastic material it provides ultimate comfort and strength. 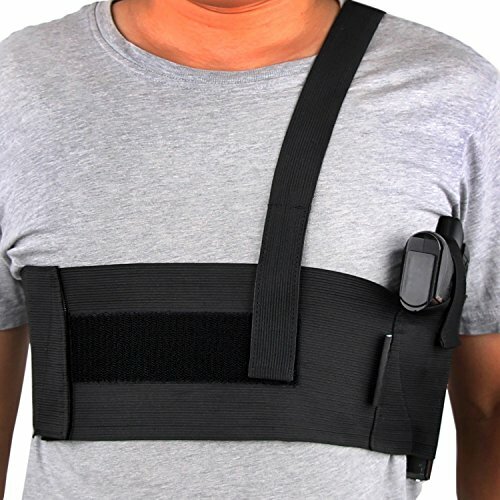 This fully adjustable unit seems more like a belly band design rather than a conventional shoulder strap holster. The Yeeper shoulder holster features an adjustable strap to wrap around the chest and it is mounted using the elastic strap that comes over the shoulder and fastens with Velcro to a web belt for optimum holster tension. In this way, the holster evenly distributes the weight of the gun to shoulders and back, enabling you to perform many activities through the day with minimal adjustment. The Yeeper universal design is apt for use by both left and right handed users and fits most popular sidearms. This holster utilizes an additional safety in the form of Velcro-fastened retention strap, but it comes without a place for an extra magazine. It shares the same features as both carrying types, making the gun pretty much invisible in the Yeeper deep concealment holster, but it also means you're not going to set any quick draw records. This holster is made of soft neoprene material and while its extra padding and position a few inches below the armpit makes it comfortable to wear all day, you should check the length of the over shoulder elastic as it tends to fall short for taller people. Overall, the Yeeper Deep Concealment holster makes mid-size pistol almost undetectable with relatively little imprinting, providing perfect concealment without much layering. When discussing handgun carrying options, one of the biggest challenges for larger people is to find a quality concealed carry rigs that comfortably when worn against their bodies. Sometimes, size provides more room to carry a concealed gun, so you're less limited than a skinny guy. It means when you are using some handy holsters, you will not only hide your plumpness but also provide convenient space for a large service sidearm. While there is no holster entirely comfortable for everybody this overview offers a few viable holster options for people of greater sizes.